Could This Be the Phenomena That Will Cause Our Life Expectancy to Decline? Have you ever noticed a baby sitting in one of those umbrella strollers just crying uncontrollably. Let’s face it, children cry and especially in the afternoon just before dinnertime. I called it the “bewitching” hour, because my kids seemed to melt down about that time of day, no matter where we were. I often wondered, though, if the child was really crying because his legs ached. They were sitting in a way that may have cut off their circulation. I know that when we travel with our grandchildren who have to sit in car seats for extended periods of time, I notice the same behavior. They just get surly. I think they just might need to get out and run around a little. We live in such a mobile world; yet here in the US we move less and less. Kids seem to move from their car seats to their couches to watch TV or play with their notebooks. Even playing with the extremely popular Legos doesn’t require much movement. Problem is, according to research they will pay a price for this behavior. Certainly, many of us adults already are. I sincerely believe that our ability to keep moving is the key to better health; however, I’m not talking about exercise, gyms and treadmills. I’m just talking about everyday moving, such as walking to a kitchen to fetch a glass of water or gardening in our yards or standing and washing dishes. Most of us seniors grew up at a time when there were no gyms and someone running for the sake of running was seldom seen. The only people I can remember running in my community were athletes, trying to stay in condition. Jack Youngblood’s mother lived in our town, and we would see him out running, but he was a professional football player. My grandparents didn’t run and neither did my parents. As children, we ran; in fact all of us did. We played hard. It was a part of growing up in our era. People did get fat, but there weren’t very many. Mostly, it was a consequence of a more sedentary career, such as a desk job. Most people I knew growing up worked on farms and other hands-on, physical jobs. Most of these people were trim if not thin. My dad was an example of this. 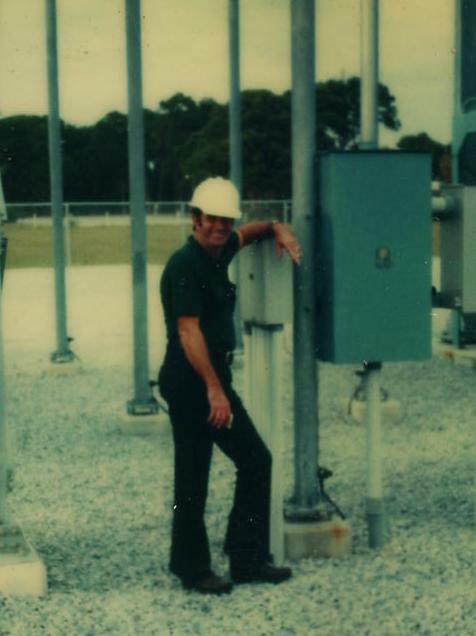 He worked as an electrician for Florida Power Corporation. He also trimmed trees in the late afternoons and weekends to send me to college. When he came home, I seldom saw him watching TV. He was out mowing the yard, washing cars, or fixing something. He was seldom still. My dad at work in middle age. My Uncle James is a wonderful example of someone who worked at a desk all his life but kept moving and maintained a good weight. Uncle James contracted infantile paralysis when he was eighteen months old in 1922. Today, it is called polio. He was completely paralyzed except for his left hand and arm. The family lived near Thomasville, Georgia, where there were several wealthy families living on plantations. Because of these families, Thomasville had a chiropractor, a doctor unheard of in most towns of the south back in the 1920s. Dr. Strobel took little James as a patient. My Grandmother Roe said that Dr. Strobel worked hard to help James learn how to walk again. His paralysis was permanent, but he showed James how to use other muscles to compensate. Finally, Uncle James could walk, though crippled and could not run. His friends called him, “Wobbly”. My uncle had a wonderful life. He never let his affliction slow him down, and his demeanor was wonderful, if not delightful. He worked at a local gas station when he was a teenager, and he had a paper route. He delivered the Florida Times Union morning paper using his bicycle. It was an early edition paper route, but he never missed delivering their papers. When he graduated from high school before World War II, the family sent him to Jones Business College in Jacksonville, so he could support himself at a desk job. He was hired first by our hometown’s local Rationing Board during the war, and after the war he went to work with the Atlantic Coastline Railroad in Jacksonville. He stayed with them almost forty years before retiring. One time when I was visiting with Uncle James, he drove me to a local restaurant for lunch. The parking lot was full, and we had to park a good ways from the restaurant and walk. I mentioned to my uncle that I was sure the state would give him a handicap sticker for his car, but he said, “No, I don’t want one. Dr. Strobel said that if I didn’t keep moving, I would lose my ability to walk. That my muscles would weaken, and I might never walk again.” I guess Dr. Strobel believed in the “use it or lose it” premise. Back when Uncle James was a baby with polio, the family worried that they would lose him. Now, Uncle James is 94 and is the only member of his family still living. His attitude and demeanor are still wonderful, and the other day one of his high school classmates gave me a message to give to my uncle. He said, “Tell old Wobbly that I said ‘hello’. I’ve noticed over the last decade that my joints hurt if I do not move enough. I really cannot afford to sit and watch a TV for an entire hour at a time. If I do it frequently, I notice that my joints begin to ache again. I actually use commercials to get up and get things done, even if it is only to go to the bathroom, wash four or five dishes, or carry a load of laundry to the laundry room. I keep moving. If I do this, my joints don’t hurt. I also noticed that it helps with weight control, and I have more energy. I’m 5’4” and weigh 136 pounds. I do not belong to a gym, and I get almost all my exercise by doing housework, yard work and walking, though my walking is usually just down the street and back. I also do Yoga for flexibility. I don’t remember ever seeing my grandmothers worry about their heart rate. They never ran or did jumping jacks or anything else. One lived to be 93 and the other 99. The 93 year old was sharp as a tack and had good health just until about five months before she passed. The 99 year old began moving toward dementia when she was about 94, but her body was amazing. She died without ever having to take any daily medication. I sincerely believe that this intermittent movement should be the basis for everyone. If nothing else, even if you cannot get to the gym or cannot run a mile, just keep moving. Our government has been surveying us, and they found that almost 50% of us report sitting for more than six hours a day. Over 65% of us spend more than two hours a day watching TV. I believe that if you’ve been sitting for more than an hour, you’ve been sitting too long. Several more studies confirmed that a regular fitness routine will not counteract the effects of prolonged sitting. This study followed 82,000 men for a decade and found that their risks were the same as those who sat the same amount of time and did no exercise. Let’s face it, most of us will not go out and race across the yard let alone run a mile. So just make your plans to keep moving. Place a program on your computer that reminds you to get up every 20 minutes like Workrave. 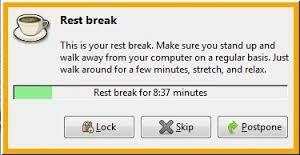 This is a software program that I use that reminds me to take a break. I use the breaks to get something done. Also, use the TV commercials like I do. Even if we DVR something, I still let the commercials run. I’m just not in the room to watch them. I guess that is why the TV commercials are so loud now. It is because of people like me. I’ve had back pain for about twenty years now, and I’ve been very fortunate to have handled it without surgery or cortisone or other invasive procedures. I’ve used exercise (Yoga), a book called “Treat Your Own Back” by Robin McKenzie, movement, ice and occasionally Motrin. Today, though, I ran across a very interesting article showing new research and findings. It seems that some of us with back problems may have an infection in our discs. Amazing. In the near future, they may prescribe antibiotics first. The article lists various reasons why your back hurts, but the one about infections in the discs is news to me. I began to take SAM-e several years ago. I read about it in a magazine and thought I would give it a try. I started taking it, because I was having back issues at the time. I made a trip to my pharmacy. I remember the first time I read the box, because I noticed something interesting. The box said that it was “clinically proven for healthy mood and joint comfort”. Healthy mood? That was certainly unexpected. I began taking it daily right away. I’ve noticed that my joints are better, but I also got a side effect–a very good side effect. Before I began taking SAM-e, I noticed that I was beginning to have these brief feelings of dread–like something bad was going to happen. This had been happening for about six months. Thankfully, they were fleeting; but I have never been one to worry about things like that so it did give me pause. SAM-e took away those feelings. My husband Harold started taking it, and he noticed that his mood lightened as well. SAM-e is short for S-adenosylmethionine. It is a naturally occurring compound made from an amino acid. 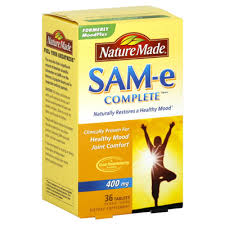 Your body uses SAM-e to produce neurotransmitters. They say that it may boost the brain chemicals serotonin and dopamine, and that low levels of both of these chemicals have been implicated in causes of depression. SAM-e has been used as a treatment for depression in Europe for the last 25 years and is becoming increasingly popular in America. Your body makes SAM-e on its own. You can’t get it from food; that you can only get it from a supplement. It is available in capsules and tablets. I take it in tablets. It’s best to take it on an empty stomach between meals for better absorption into your bloodstream. I take it with a glass of water, as soon as I rise. I take my synthroid at the same time. They say that there is no standard dosage. Supplements range from 400 to 1,600 mg. Experts, though, recommend starting with 800 mg twice a day, but I only take 400 mg a day. As usual, though, you may want to talk to your doctor first. I’m told that SAM-e can cause some minor side effects, such as stomach upset, anxiety, and trouble sleeping; but I have had none of these side effects. It can interact with certain antidepressant meds, so always talk with your doctor if you’re thinking about taking it and are using other drugs. They say that you shouldn’t take SAM-e for bipolar disorder. One report from the Agency for Healthcare Quality and Research, which analyzed the results of 28 studies, found that SAM-e was about as effective as standard antidepressant meds. It can be pricey, though–up to $200 a month for the recommended dosages. I take half the dosage and buy mine at Cosco when it is on sale. Doctors aren’t entirely sure why it tamps down pain, but they know that it reduces inflammation. Studies by the University of Maryland School of Nursing and the University of California, Irvine, showed that SAM-e was as effective as some NSAIDs in easing osteoarthritis aches. The researchers in California found that SAM-e quashed pain by 50% after 2 months, though it took a few weeks to kick in. SAM-e produced no cardiovascular risks and fewer stomach problems than the conventional meds. Harold and I are believers. We take it every day now, and we have for over a year. Note: No one paid me for this. I just felt that it has helped us, and I wanted to spread the word. Are Most of our Everyday Aches and Pains Postural in Nature? 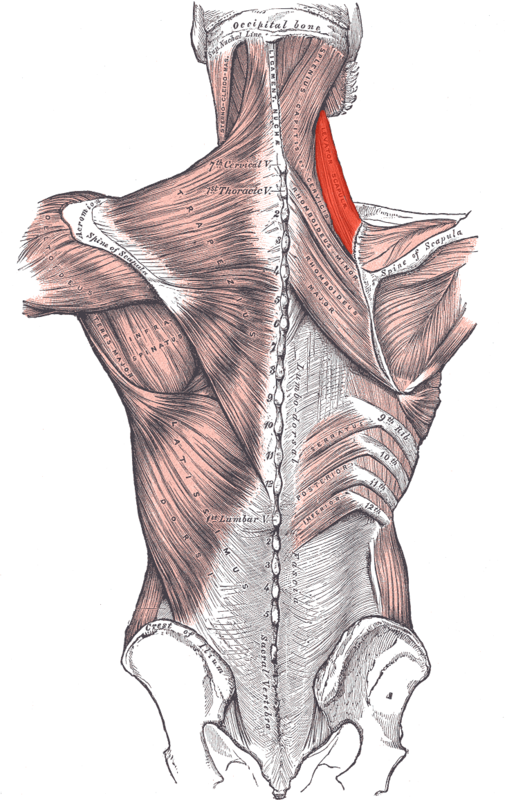 So I’ve been having neck and shoulder issues lately on my right side. 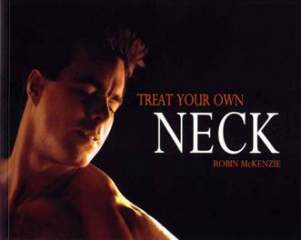 I’ve had such great success with Robin McKenzie’s books, “Treat Your Own Back” and “Treat Your Own Neck”, that I bought “Treat Your Own Shoulder”. I continued to read “Treat Your Own Shoulder” though, because I periodically have trouble in Yoga with my upper arm and shoulder on my left side. It is always a little stiffer than the right. I was hoping to learn how to loosen up that side of my torso. I’m glad I continued reading, because he confirmed what I found a few years ago about postural changes that were needed. It seems I needed a refresher. Just identification of the changes needed will help me correct these. For example, several years ago I figured out that I had been sleeping on a pillow incorrectly. I liked to lay on my back with my head on my pillow and my shoulders off. I learned as I got older that I needed to have my shoulders supported, as well as my head. So Mr. McKenzie just reminded me to be more conscious of how I sleep on my pillow. He also added that I shouldn’t sleep with my arms raised over my head. Darn, that feels so good when I’m falling asleep, especially if the night is a little warm. I guess I need to stop doing this, too, because he says that I’m over stretching my arms. Also, he talked about postural problems with sitting or standing with your arms in a raised position. I sit a lot at my computer and my right arm is always raised when working with my mouse. I just realized that having my mouse higher than my keyboard may be causing problems for my right shoulder. My right arm is always in a raised position, which probably causes problems for that shoulder. I’ll try to correct this. I should have suspected this, because lately I’ve been periodically trying to maneuver my mouse with my left hand, just to give my right side a rest. Was that my body trying to send me a message? Also, I’ve noticed that sitting in arms chairs with my arms resting also raises my shoulders. I am of average height, but most chairs today seem to be bigger and made for taller people. I have to rethink sitting in arm chairs, and purposely not using the arm rests. I find that if I let my arms rest down by my sides in the chair, I do much better. I also like to lean from one side to the other, and this is a serious “no no”. I learned this years ago when I drove an SUV which had a nice console armrest between the seats. I liked to lean on my right elbow on long drives. Consequently, I developed neck problems on the right side of my body. I stopped leaning, and the pain finally went away. which I keep in my medicine chest. I don’t remember any of these aches and pains until I turned forty. I guess before then, we healed so quickly that none of these problems surfaced. Maybe all it took then was a good night’s rest. Our 40s were some of our most difficult years. My girlfriends and I, most of which are in our sixties, agreed on this one epiphany. I had a partial hysterectomy at the age of 43, and within a few years, I went through some major problems. I thought it was the surgery, but I found out it was much more. There were night sweats, hot flashes, loss of hair, loss of sleep, fatigue, aching joints, constipation, and weight gain. Some of my friends who hadn’t had a hysterectomy were going through the same thing. Me at my top weight. I knew I was getting older, but I just wasn’t ready for this. My body changed in my 40s, and I didn’t realize that I had to make some big changes in my life to feel good again. Trying to hide it under a suit. I visited my general practitioner, who checked my hormones. He said he had good news and bad news. I said, “Let’s do the bad news first”. He said, “You are in menopause”. I asked if 46 was a little early, and he said yes but sometimes after a hysterectomy things just give up. “So what is the good news,” I said. He said, “You are finished. Menopause is over.” I remember going home and telling my family. They all said that they already knew this. I hadn’t been very easy to live with. I weighed almost 150 pounds in my 40s. I began to get really serious about my diet, and so I tried anything I could find. I tried the South Beach Diet, the Atkins Diet, the Mediterranean Diet, some sort of a carb diet, and even a diet where you could eat anything you wanted as long as you ate it in an hour. The last one was Chuck’s favorite–not. I just about ripped the face off a waitress one night, when she didn’t bring our dessert within the one-hour time limit. You name it, and I’m pretty sure I tried it. I even tried the pills, but not more than a couple of weeks. They made me jittery as heck. I think I can safely say that my 40s will be remembered as the decade when I was always hungry. In the meantime, my health in my 40s was going downhill fast. My cholesterol kept inching up, along with my weight. I was in an extremely stressful job, and my waist line was quickly catching up with my hips. I learned about cortisol. I read everything I could get my hands on. “Prevention” magazine replaced “Self”. Finally, I really messed up when I threw out my back. I found myself incapacitated in a world that stops for nothing. With my kids gone, my work had become my life; and now it was costing me my life. I loved what I did, but it was getting harder to do it. So what did I finally do? 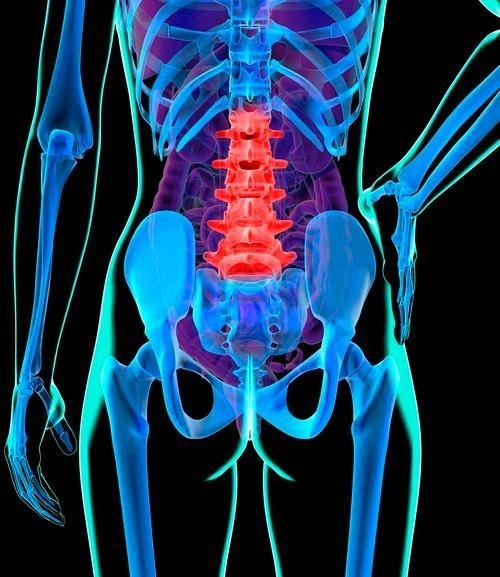 I decided that I didn’t want to have back surgery, and I got really lucky because I found a doctor that didn’t believe in back surgery, unless absolutely necessary. He was a surgeon himself, but he also ran a rehab unit. He ordered an MRI. We could see exactly where the problem was, and then he ordered physical therapy, work with a chiropractor, and a message therapist. The physical therapy was designed to rebuild the muscles I needed in my frame, and he had me work with weights. I truly had trouble. It was very painful at first, but I got through it. It took me an entire year. In the meantime, my doctor moved away to another city, but he had given me a good head start– information and techniques that I continued to use. Speaking of relapses, if I knew then in my 40s what I know now, I would have never injured my back as badly as that first time. I know exactly what to do at the first twinge of back pain. I know what that little sensation means, and I quickly moderate my movements and lifestyle. I’ve learned how to better take care of myself. Usually, they occur because I didn’t move enough during a long trip or I had been sitting at my computer too much. I get lazy, and I forget about my problem until it bites me again. Speaking of changes in lifestyle, I resigned from my job and began working in one that required less travel and offered a less stressful atmosphere. I guess I’m blessed, because the new job paid better, too. It took me over a year to make the change, but it was worth it. In my 40s I learned to sit better, have better posture, to not lean on the arm rests, and to maintain good alignment at all times. I try not to cross my legs now. In other words, I can no longer slouch like a young person. My body doesn’t heal itself as fast, so I have to be more careful. I hardly ever sit through a full television program. I use the commercials to get up and do something, even if it is only to wash five dishes. The point is not to get something done, but to get up and move. I try not to sit in the same chair all the time. My chiropractor helped in the beginning, but I’ve learned what not to do to help me stay in alignment. I bet I haven’t seen my chiropractor five times in the past ten years. I rely on yoga for my exercise and weight work. I go for a one-hour session twice a week. Core work is vital to my overall health now. I learned that if I pull something or if something is aching, I ice it down. Most likely, it is inflammation; and ice works best. I do like warm to hot baths, though; but I now only use them to relieve stress or when I ache. I got my weight back to a good 135 lbs using Jenny Craig. They taught me portion control mostly. I have some dishes from my mother’s everyday set of dishes, and her dinner dish is the size of today’s salad plate. So I eat on a salad plate, the size of a plate that my Dad used for most of his adult life. Plus, it is amazing how much food is pushed at us every day. I can make three meals out of the portions many restaurants currently serve. I can eat almost anything as long as I always watch my portions, but I don’t eat anything I want. Again, I had to realize that my body changed. I learned about fiber, and I started eating a lot of vegetables and fruit (at least five a day). I really developed a taste for vegetables. I love them! And a piece of fruit is like eating candy. Everything is sweeter since I learned to limit my sugar intake. Speaking of sugar I gave up two loves of my life: Coca-Cola and Sweet Iced Tea. I transitioned to Diet Coke and unsweetened tea with lemon and Splenda. Honestly, that was the first change I made, and I lost 8 pounds. I try to eat protein at every meal. I eat mostly chicken, fish, and seafood, but every once in a while I love a good steak (about the size of a deck of cards). I try to keep it under 6 oz. I love bread, but I save my bread calories for whole grain bread. If it isn’t whole grain, I don’t eat it (this one is still really hard for me.) I also try to eat one carb at every meal. It always keeps me from getting hungry. My carb portion is always meager and is a whole food (a small potato, brown rice, etc.) I try to stay away from creamy sauces. I transitioned to whole foods. I went back to whole milk and full fat cheeses. My doctor explained that our bodies need fat and to steer away from no fat or very low fat. I do not have heart disease. I sincerely believe that if I cannot eat breakfast, I can at least drink a glass of whole milk. Milk is full of nutrients and has enough fat content to give me the protein and fat I need to keep me from getting hungry. Skim or even 1% doesn’t give me that. I try to eat an egg every morning with a piece of whole grain toast, a small glass of whole milk and some fruit. I never skip a meal, but if I did it certainly wouldn’t be breakfast. It gets my metabolism going for a good calorie burn all day long. I believe it is vital to maintaining a good weight. I take some supplements for what I lack. I worry about Vitamin D and calcium, though I get most of my calcium from my foods now. (I later learned that I was Vitamin D deficient, and my doctor prescribed 10,000 iu a day). You can read about what my doctor prescribes here. Do I fall off the wagon? Oh dear, yes; but I always try to climb right back up on it, if not the next meal, the beginning of the next day. I went on a cruise last fall and it took me until spring to get back to normal. It was hard to do during the holidays. I almost never step on the scales, but I let my clothes give me guidance. I never buy a larger size; and when my slacks are too tight or my bra cuts into me, I get real serious. Usually, that means, no bread, no alcohol, and no dessert. Otherwise, I stay to one alcholic drink a day in keeping with current instructions from the medical establishment. By the way, dessert is a thin slice or about a half cup portion. It is really just a taste; but once you get used to it, it works. Another way is to allow yourself just one good dessert a week. I save mine for a really yummy one, made from scratch. And no cheating with a frappecino from Starbucks. At 60 I was 5’4″ and weighed 135 pds. I wore a size 8, and I have for about fifteen years now. My measurements are 38, 30, 39. Not exactly 36, 26, 36; but hey, I’m 60. If I go below 133, I don’t look good. My face is gaunt, and I don’t exactly feel good either. I got down to 128 with Jenny Craig, but that was way too low. I seldom ache now. I have no trouble with constipation. I feel good, and that is the best barometer of all. My 40s were full of bad moments, but the good news is that you finally figure it out and your 50s get much, much better. Even better? Several of my friends in their late 60s tell me that their 60s are the best of all. I’m just now 60, so another chapter begins! Wish me luck! How were your 40s compared to your earlier or later decades? What changes did you have to make? What did you find that worked for you?